Eleven students from Collegiate Academy participated in their final competition of the year at Behrend on Friday, April 12. Click the headline to read the full story. Click the headline to donate. And be sure to watch our lip dub video! Would you like to perform at Senior Banquet on May 10? Click the headline for audition dates and times. The Lion's Den is looking for motivated students to work in Collegiate Academy's school store. Click the headline to fill out an application. Junior Jasmine Henry named Jet 24 "Good Kid"
Northwest Pennsylvania Collegiate Academy is an urban, college preparatory magnet school with a 100% four-year college acceptance rate. Approximately 500 eighth graders apply for about 225 freshman openings. Admission requirements include a minimum grade point average of 3.0, national standardized test scores at the 75th percentile or above, and two teacher recommendations. Collegiate Academy offers 25 Advanced Placement courses, all taught by College Board–authorized faculty. The total student body takes approximately 800 Advanced Placement tests and completes over 100 dual enrollment college courses each year. Students are required to take three AP courses, and most graduate with several more. Newsweek’s annual report of top American public high schools again ranked Northwest Pennsylvania Collegiate Academy number four in Pennsylvania and top 1% nationally. In September 2013, the U.S. Dept. 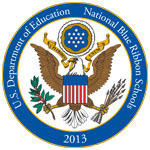 of Education designated our school as one of fewer than 300 Blue Ribbon Schools in the nation and the only Pennsylvania high school in the 2013 cohort, based on criteria like test scores and rigor, staff collaboration, and community outreach. Collegiate Academy's 2017 graduates had an average SAT combined math and critical reading score of 1183 and writing score average of 545. The class of 2017 received over $17 million in college scholarship offers.